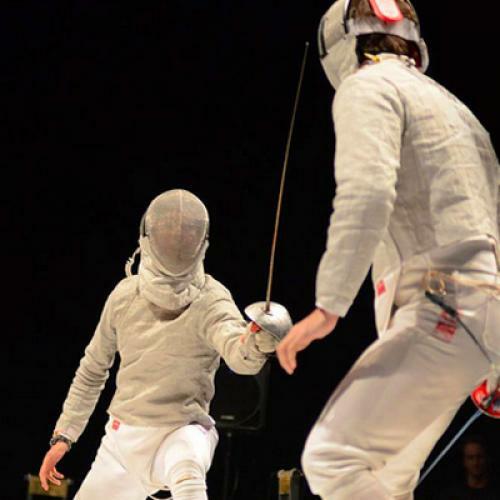 Four years ago in Beijing, James Williams won a silver medal as a member of the United States’ Men’s Sabre team (sabre has quick slashing; what you probably picture as fencing more closely resembles the ripostes of épée and foil). This year in London, Williams additionally qualified for Men’s Individual, losing in the Round of 32 Saturday morning. Tomorrow, starting so-early-it-won’t-even-be-bright with a draw against top-seeded Russia, the Men’s Team competes. Hopefully they will last into the early afternoon. I asked Williams, a good friend, to give me his take on what it’s like to compete in the Olympics, deal with finicky Brits—and live in the Olympic Village, if you catch my drift. When he rang me up Tuesday, my phone told me I was receiving a call from Colorado; turns out he was using a phone provided by the U.S. Olympic Committee, which is based in Colorado Springs. The interview has been edited for brevity and clarity, but not probity. How are you feeling about the Team competition? I think it’s a good draw for us. Though they’re the number one seed and we’re the number eight seed, there’s a lot of parity. In Individual, two of my teammates beat two of the Russians, and I lost in a close match. I think we feel confident. Is the U.S. team good friends with other particular countries’ teams? Goes from sport to sport. The men’s sabre team gets along really well with the Spanish and the Ukrainian ones. I know the men’s water polo team went off to Croatia to train, the wrestlers to Belarus. I think the way the countries are situated must be decided upon. All the Scandinavian countries are by one another. We are next to a lot of small countries. We share a courtyard with Italy and Spain. We’re nowhere near the DPRK—I think China and North Korea are next to each other. What else would I not expect about the Olympic Village? There’s a recording studio where you can do your own rendition of the Olympic theme song. And you can pick one of seven different genres of song—hip-hop, reggae, hard rock, classical. Someone from Antigua was in there before us. What did you do today? How is downtime spent? Woke up kind of late, got breakfast in the Olympic Village dining hall. How’s the food? It’s really good. There’s an immense amount of variety. I like making cultural smorgasbord on my plate. I put kimchi on random things. Then we went to the venue to watch the Men’s Individual Foil. We did okay, but no medals. An Egyptian came in second, and that was the first time an African won an Olympic medal in fencing ever. After that we had practice at the competition space. We got into a little scuffle with the volunteers. Typically when we practice we wear sweatpants or shorts; we don’t wear our competition gear, and we don’t wear knickers because it’s not target area in sabre. There’s also a protective piece called plastron: you wear it under your drag jacket, but only during competition. One of the volunteers came up and told us we are not allowed to practice without it. So we ended up having to buy it. Are such demands normal? No. Very unusual. I think it’s because it’s the Olympics, it’s the strictest enforcement of all applicable rules. Do you get freebies? Are all expenses paid? Yes and yes. The U.S. team is sponsored by Nike and Ralph Lauren. One of the most exciting days is the day that they outfit you. They gave us two backpacks and two duffelbags worth of stuff. There’s this Nike—I think it’s the podium jacket—it’s some kind of cool, futuristic material. Ralph Lauren gave us a cardigan sweater that says 2012 U.S. Olympic Team on it. They also gave us these crazy sunglasses that only have one frame—they’re Cyclopsy, but like one really cool Cyclops. I mean Cyclops like X-Men, not like some Greek monster. Are you able to get close to the basketball players during the opening ceremony? Yes. And one random night, a day or two before, all the NBA stars were right outside the U.S. housing area, just kind of hanging out. They were just sitting around being mobbed by other athletes for photo requests. They were very nice. Do American Olympians care about the overall medal count? Are they upset about falling behind China? Yeah. It’s a point of pride. I think we care because we feel like we’re sort of parts of a larger whole. It’s still early. I’m not worried that we’re behind China right now, it’s still quite early. How are international romances looked upon? I have never heard it to be encouraged. I am sure that it is not taboo. I suspect some national governing bodies would be sort of distressed. Okay, tell me about the condoms. There’s nothing funny written on them, like last time. Last time they were amazing. On the packages there were little pop-up boxes with Yao Ming or someone saying, ‘Many athletes have AIDS,’ and many stick figures enacting acts that could or could not give you AIDS.